Looooooove. So much love for all of these. Okay let me go through and list mine. As I said before, I don't go too in depth with the mental health side of it because I feel unqualified to diagnose. I just want to comment about your headcanon of Arnold being Demi. My reaction was: "Make a stupid grinning face that captured the attention of my mom." Can you imagine that scenario: "Why are you grinning like that?" "OH A BUDDY ON THE INTERNET AGREES WITH ME ABOUT ARNOLD'S SEXUAL ORIENTATION." Sorry, it's just as a Demi myself, I really felt that Arnold was the same way. Sorry, too many feels! I mean, he definitely has a weakness for a pretty face, but he really falls in love with the good in people and I think that will always be what guides him. Yeah, I thought that too! Aaaah you guys are so nice ;w; Those are some A+ headcanons too and I'm glad I could make you smile Aibou!! I love demi headcanons but sometimes people forget to specify what KIND of demi. Just saying "demi" doesn't tell me who you're attracted to, you'd have to say like "demihetero" or "demipan"
Fair enough on Stinky. I personally am at the point where I don't really have any sort of label for myself and I guess I sort of just put Stinky in that category of "I don't know what you'd call it, really, but I like pretty girls and holding hands with my best buddy Sid. Whatever that is. IDK." Personally, I feel that if we're talking about orientation, there really is no black/white, no "YOU ARE EITHER HETERO/HOMO/BI". There's a lot of gray zone in there (like LeSkuh's headcanon for Stinky). 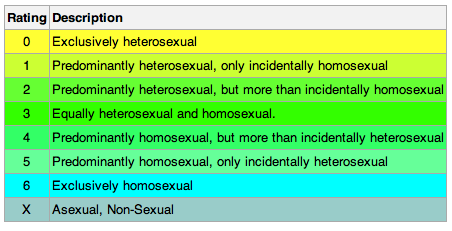 Whenever one of my best friends and I would have deep conversations about the sexuality/orientation of fictional characters (which actually happens a lot), we would always refer to the Kinsey Scale. It makes things a lot easier! So, I feel like Stinky would be a 1 or a 2 (I'm glad we agree on that too!). I personally think Stinky is Bi-sexual (or Homosexual which to me is more likely, I'm guessing on the chart, Stinky could be at either 2-4) and that he's more in to boys than the opposite gender, like it's 40% girls and 60% boys. I do agree with Sid and Eugene about being homosexual! Yeah Stinky is probably a 1 on the Kinsey Scale~! I've always leaned towards Sid being bisexual though, with a preference towards guys because of the first season hinting towards him having a crush on Rhonda. But I can also see him crushing on Rhonda because that's what boys are "supposed" to do and later coming out as gay after he stops being so paranoid about it. I headcanon Big Gino as hetrosexual with sociopathic tendencies (if not a straight up sociopath in general. I always envisioned that he'd become a ruthless mafia boss when he got older). I also have a headcanon that when Sid got older, he was able to join up with Gino's gang again after begging his way back. Sid develops a crush on Gino and Gino plays along just to get a kick out of it and laugh about Sid behind his back with his goons. nooOOOOO GINO IS NOT ALLOWED TO HURT MY SID??????? A+ headcanons from rainbowraider omg!! SpectrumBunny wrote: nooOOOOO GINO IS NOT ALLOWED TO HURT MY SID??????? Thank you! If there's one thing I'll never run out of, it's headcanons. And as much as I like Sid, I feel like he's really vulnerable to peer pressure and trying to fit in, so I think he's bound to make poor decisions when he gets older. But I do like to think that eventually he'll learn from his mistakes and live his life more or less happily.